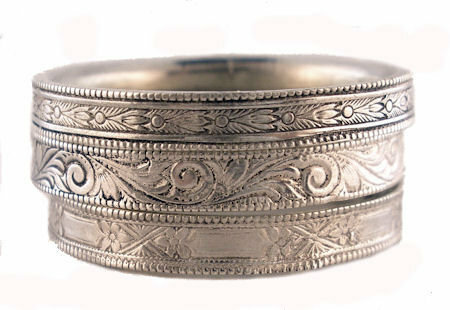 Antique reproduction bands from original molds or roller wheels that are over 100 years old, Victorian style wedding bands, hand engraved bands, embossed wedding bands, Civil war style bands for gents, stackable bands, continuous designed bands and antique style wedding bands. Most can be cast in any metal: sterling silver, 14k gold (white, yellow, rose gold or green gold), 18k gold (white or yellow) & platinum. Create your own look, have fun and stack them for a mix of metals & styles. Each item is marked with our estimated shipping time, please allow extra days for delivery and resizing if requested.